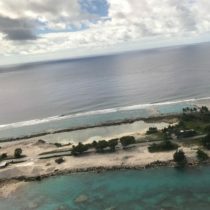 Marshall Islands was the site of nuclear tests from 1946-1958. The largest denotation was so powerful that it could be seen from Okinawa, Japan 2,600 miles away and debris from the bomb was found in cattle in Tennessee. Founded in 1986, they number 1,255 islands in total. It’s capital is Majuro and the time zone is 17 hours ahead of EST. 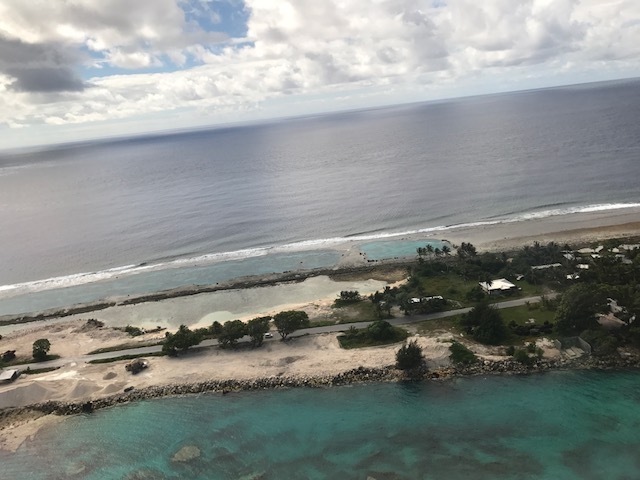 ~ 53,000 people live here and the main languages spoken here English and Marshallese.Their primary exports are passenger and cargo ships, frozen fish, recreational boats, special purpose ships, and refined petroleum. 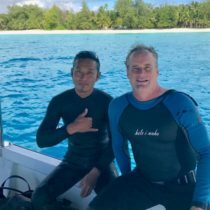 When visiting, divers should check out the Kalalin Pass in Majuro. The Pass ranges from 30-130 feet deep, and tourists call it an “aquarium” due to the diverse sea life there. Hotel(s) I Chose: chose Bikendrik because I’ve become a bit of a hotel snob and Reimers got horrible guest reviews. 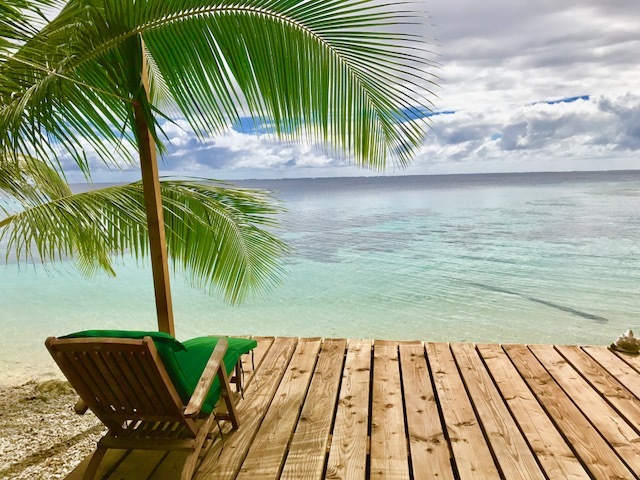 If roadside motels are your thing, you’d love Reimers, but as there’s not much in downtown Majuro, I chose the pricier Bikendrik, which, in retrospect, was an excellent decision. 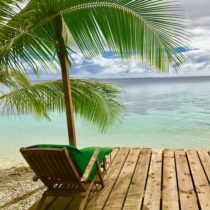 The world travelers ahead of me said that the Marshall Islands were a dump, however, I loved my time here. 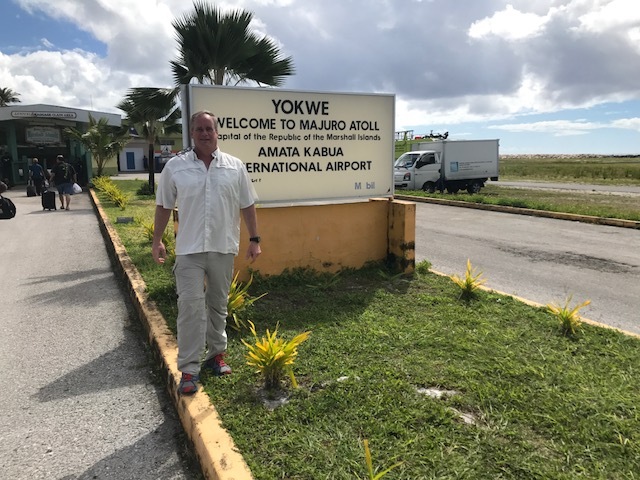 I arrived and took a $5 taxi ride from the airport to the center of downtown Majuro. 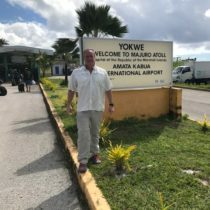 From end-to-end Majuro is 35 miles long and on average is about 100 yards wide. Joe Iteran, my driver assured me it wasn’t difficult to find your way around the capital city and it was impossible to get lost because the road only goes “this way and that way”. Once in the city center I went upstairs at the Reimers Hotel to have a cold drink while waiting for my water taxi to Bikendrik Island, which was about 30 minutes away. I chose Bikendrik because I’ve become a bit of a hotel snob and Reimers got horrible guest reviews. 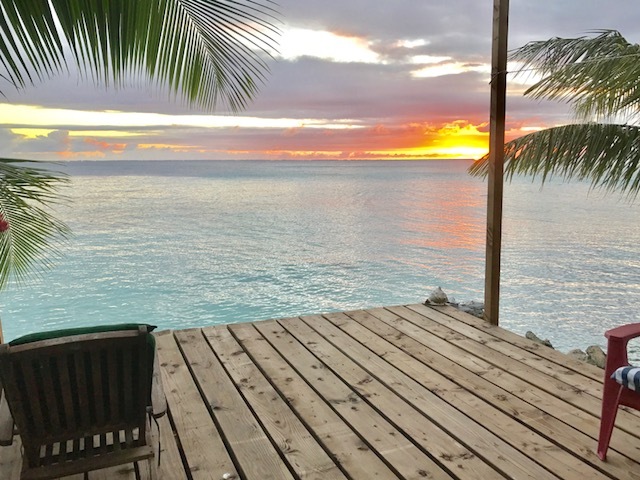 If roadside motels are your thing, you’d love Reimers, but as there’s not much in downtown Majuro, I chose the pricier Bikendrik, which, in retrospect, was an excellent decision. 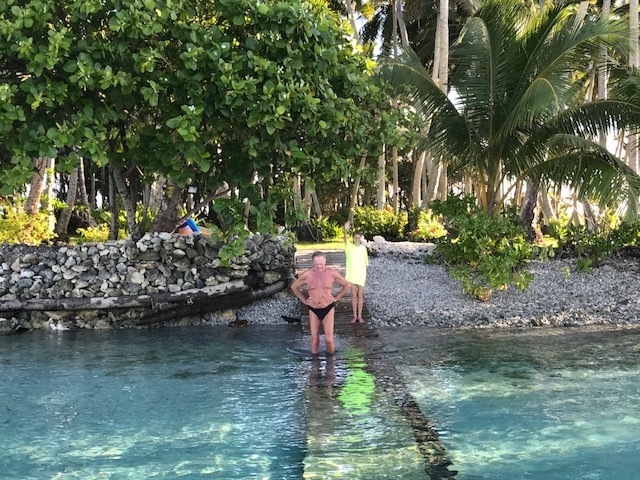 The island’s proprietors, Lutz and Suzi Keyser, greeted me warmly and immediately showed me to my oceanfront lodge at the edge of the lagoon. The accommodations were clean and crisp; island-chic. The queen bed was heavenly, the bathroom exceedingly clean, complete with an indoor and outdoor shower. But the real attraction was the deck overlooking the tranquil waters. I sat mesmerized for hours, deep in thought, which is not a luxury in which I can normally indulge. The food, all cooked by Suzi, was extraordinary. Hamburgers and fries? Uh, no. For lunch, think beef strudel, for dinner fresh tuna, and parrot fish with sauteed potatoes. Desserts were out-of-this-world. Every morning Suzi baked up fresh croissants, which were light and fluffy. While I was concerned about unsanitary food preparation in Majuro, there was no such concern at Bikendrick. This food was as good as any I’ve eaten at 5-star restaurants worldwide. Suzi’s husband Lutz is an astronautical engineer and has developed rocket systems in Zaire/Congo, Libya and other countries over the past 40 years. He claims his designs can send a rocket into space for 1/10 the cost of other commercial launch companies. Lutz and I ate most of our meals together (so I wouldn’t have to eat alone) and I cherished my conversations with him and Suzi. I heard harrowing tales of their times in the African jungle with Mobutu, working in Gaddafi’s Libya, how they came to Bikendrick and other stories I hope they will tell you. 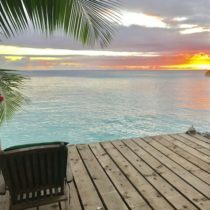 When they arrived on the 3 acre island 10 years ago it was just coconut trees, but they have built it into a 3 house paradise. 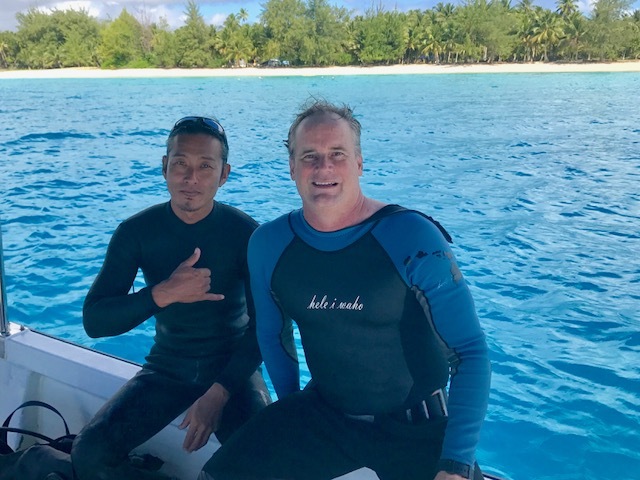 I went diving with Hiro, a Japanese dive master, who has a reputation of being highly reliable, a rarity in a place where tomorrow never comes and little ever gets done on time. The water was clear and the fish were plentiful, and if I ever come back I hope to go to Bikini Atol. Overall, I loved my time at Bikendrik and both I and the Keysers were sad to say goodbye. Suzi gave me a 5-second embrace before I got on the boat and Lutz a firm handshake. We exchanged final waves before my boat sped off, and I smiled knowing I have discovered one of this world’s truly special travel destinations.